Political Science Major Interned in D.C.
And a career in public policy is what the senior economics and political science double major has sought ever since she took a class called Contemporary Global Ethics in high school. The course explored how countries interact as they pursue the creation of a better society. “I was hooked,” Kentfield says. 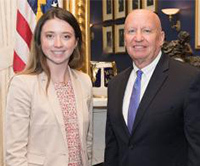 During the spring 2018 semester, Kentfield interned for the Committee on Ways and Means in Washington, D.C., as part of Creighton’s Capitol Hill Internship Program (CHIP). Participating students intern full time during the day and take classes at night. As a policy intern, Kentfield drafted press releases and investigated policy proposals for committee staffers and members. She produced reports on the Social Security Administration and the IRS and investigated policy issues at such events as Adobe’s Digital Citizen Summit, American Enterprise Institute’s Numbers Behind the Opioid Crisis and the Committee for a Responsible Federal Budget’s Better Budget Summit. It was a schedule that contradicts the perception that people “don’t do anything in Washington,” she says. 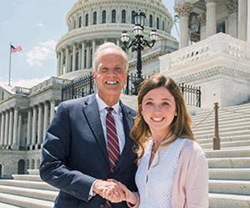 Internships for Sen. Jerry Moran and Rep. Kevin Yoder, both from her home state of Kansas, were “transformative experiences” that further cemented her interest in the marriage of political science and economics. “Economics are the base to any measure of politics, and it is necessary for understanding the functionality behind public policy implementation. My economics classes have taught me the intricacies of fiscal and monetary policy in the United States and the variations of public choice,” Kentfield says. 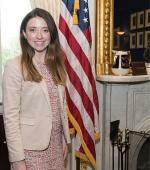 Participation in Creighton’s Institute for Economic Inquiry (IEI) has both opened doors to Kentfield’s political internships and helped build the skills she relied on during her time in Washington, D.C.
“Our open discussions in the IEI program have increased my willingness and confidence to participate in a room filled with America’s leaders in public policy,” she says. But there is another quality that further distinguishes Kentfield from her contemporaries from other universities – compassion. She attributes much of her success to the compassion and team-building skills Creighton fosters in its students. While family played into Kentfield’s decision to attend Creighton – both her parents are graduates, and her grandfather, Tony Barone, was the men’s head basketball coach in the 1980s – the academic challenges and values-driven education Creighton provides carried equal weight.